You must Install English Version of Paltalk Messenger (Classic) and Microsoft NET. Framework 4.0 to Use the Mass Tool Software. It does NOT work with other Languages of Paltalk Messenger . I think I forgot to Publish this on Dutchplace. Well now you have it. Mass Tool is Inspired by Twiza's Mass Invite Software for Paltalk, which sadly stopped working a few years ago. 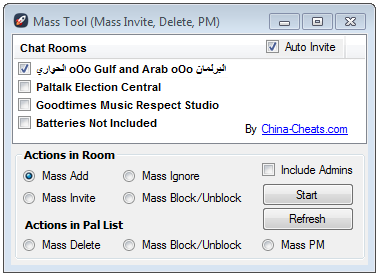 With The New Mass Tool you can Mass Invite, Add, Delete, PM, Block/Ignore and even send Mass PM's to Users in your Pal List. You can connect to Single or Multiple Rooms at the Same time. My Favorit Option is the Mass Delete option which allows you to Delete All Users in your Pal List. You can delete upto 1000 Users Manually in no time. This is the best method for Cleaning your Pals List or BuddyList on Paltalk and with Just a Single Click. To Mass Delete Nicknames in your Pal List, Please Expand the Offline Pals and Online Pals List first, befor Clicking on Start Button. Important: You must Download & Install Microsoft NET.Framework 4.0 first. Then make sure you Install Paltalk in English Version in order to use the MassTool! 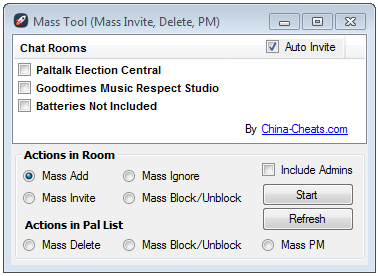 - Mass Block in Room + Pal List. Notice: When Joining a New Room click on "Refresh" button to Refresh the New Chat Room Names in the List. IMPORTANT: Some AntiVirus Software flag the Software as a Virus. Its because of the String Eneryptions Method we use for protection of our Softwares. Please add the MassTool.exe file as an exception in your Anti-Virus Exceptions List to avoid auto removal of the Software, incl. False Flags and Warnings. PS, If you have any suggestions or feedback regarding the Software, then please share it with us!